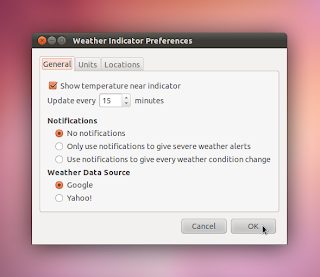 There is no weather indicator included in the official repositories for Unity till now. However, you can install one from a PPA. Update 10/17/2011: By now it's in the official repositories of both Natty 11.04 and Oneiric 11.10. So, you can also just install it with the command below. However, the PPA version for Natty is more recent than those in the official repositories, and I'm quite sure it will be the same for Oneiric after some time. Once installed, search the Dash for 'weather indicator' and start it. You can find the common options that you would expect to be there in a weather indicator by clicking the indicator and choosing 'Preferences' as shown in the screenshot above. This indicator applet also supports notifications which can be configured under the 'General' tab in 'Preferences' dialog. And it gets added to Startup Applications itself on installation so it runs automatically when you login. If you need to manually add it to the startup, search the Dash for 'Startup Applications' and open it. Click 'Add' and add a new entry with the command 'indicator-weather' (without quotes).